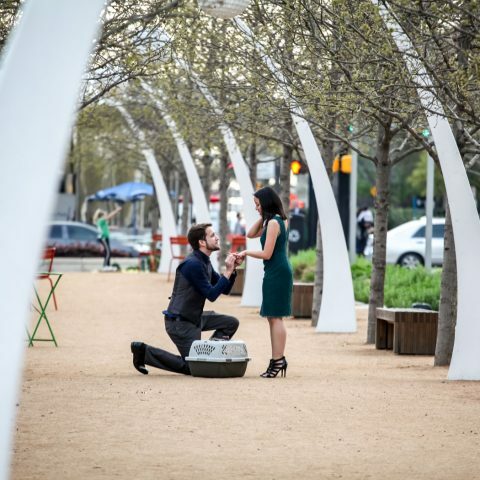 “I never in my wildest dreams thought I would be the one to propose, given my cultural heritage,” said Amita. “On top of that, as a lesbian, I never thought in our lifetime our union would be recognized legally in the U.S.,” she said. A Ugandan refugee who fled to the U.S. with her parents over 40 years ago, Amita said she felt she was given a second chance at life and liberty in the U.S. While the rain drizzled around them, she dropped down to one knee and proposed to Kristen with a custom ring from Goldsmith’s in their hometown of Lambertville, New Jersey, and Kristen joyfully accepted. In October 2005, Amita and Kristen both attended Outfest, a pride event in Philadelphia. The pair had mutual friends, but had never met before. Glancing across the bar Amita , she noticed a pretty and unfamiliar blonde chatting with her friends. She was wearing a blue hoodie with her hair swept up into a ponytail. She played it cool and swaggered up to where Kristen was standing. “I was getting introductions, when suddenly this hot woman walked into the circle!” Kristen said. Kristen gave Amita what she calls “my version of a feminine handshake,” to make sure she showcased her sweet and innocent side, but Amita was having none of it. “‘Can I give you some feedback?’” She said. Their friends rolled their eyes at the thought of her digressing with ‘corporate’ lingo, but she continued. “I couldn’t help but notice how beautiful you are, but I wasn’t sure if you wanted to meet me, or if I was supposed to bow down and kiss your hand,” she said. Kristen welcomed Amita’s feedback with a spunky smile, saying that the she was thrilled to make her acquaintance. Kristen was immediately attracted to her obvious confidence, and Amita was instantly drawn in by Kristen’s beautiful smile and her sense of optimism. Later in the relationship, she revealed that she knew the instant Amita approached her that she was going to get a formal date out of her. They fell fast and hard for each other. Three weeks into the relationship, Kristen told Amita that she loved her. Everything about Amita, her passion for life, family and friends, her strong work ethic, her values, all pointed Kristen towards what her heart already knew: she had found The One. For Amita, she knew for sure when they met again in Philly for a weekend getaway, five months after their initial meeting. She had an overwhelming feeling about Kristen, and their future together. She decided to surprise her with a knot ring from Tiffany’s. When she slipped it onto her finger, she just knew she was in love. The happy couple solidified a lifelong commitment with their iconic marriage proposal. Using surprise engagement photography, they were able to capture the sentiment of their engagement. Smiling and embracing, they walked across the rainbow crosswalk that was painted at the intersection where their paths first crossed. Our photographer discreetly captured each magical moment. View their photo slideshow, here. Seeking help planning and capturing your own marriage proposal? Check out other LGBT marriage proposals we have helped plan and photograph for inspiration. Ready to commit? Contact one of our proposal experts for a free proposal planning consultation.